“Carolyn Hart’s work is both utterly reliable and utterly unpredictable. What the Cat Saw will surprise and engage any mystery reader. A fill-in job lands a young woman right in the middle of a murder case. Nela Farley’s life is in ruins since the death of her fiance and the loss of her job as an investigative reporter. So it’s easy for her to take her sister Chloe’s place while she goes on a once-in-a-lifetime vacation. Chloe, who works for the Haklo Foundation in Craddock, Okla., has everything arranged for her sister, including a garage apartment behind the mansion of Haklo trustee Blythe Webster. The apartment was used by Marian Grant, who ran Haklo until she was killed in a fall over the apartment railing. When Nela looks into the eyes of Marion’s cat Jugs, she reads his thoughts, which indicate Miss Grant’s death may not have been an accident. She’s barely settled in the guest room before an intruder enters the apartment, though her call to the police chases him off. Nela cleans up, buys a doorstop and makes the shocking discovery of a diamond necklace in Marian’s purse. Nela’s work at the foundation is easy, but things are not right there. Numerous incidents of vandalism have occurred, and staff members are at each other's throats. When more trouble dogs Haklo, the police suspect Nela and Chloe. Only Steve Flynn, who runs the local newspaper, believes in Nela’s innocence and promises to help her discover the killer before she becomes the next victim. 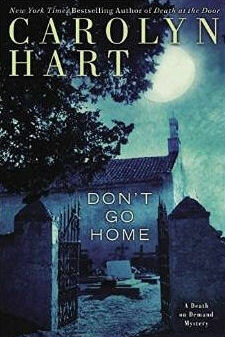 Veteran Hart (Death Comes Silently, 2012, etc.) launches a new series with a combination of red herrings, romance and what some readers will consider the bonus of a psychic cat. In WHAT THE CAT SAW, by Carolyn Hart, Nela Farley makes an interesting discovery when she agrees to care for a highly intelligent cat named Jugs. Whenever she look into the cat's beautiful eyes, she "moves into his mind," and immediately receives messages about a murder he witnessed. Hart’s unusual method for revealing clues is a highlight of this tense drama as each is exposed through Jugs the cat. Although Nela’s relationship with Steve is professional, there’s a hint of romance and a continuing series. Each character is carefully layered and woven into a story filled with thrills and surprises. Ever since the death of her fiancé, Nela Farley has found herself plagued by a sixth sense: she understands the thoughts of cats when she looks into their eyes. Nela knows that what she’s experiencing is completely irrational and tries to convince herself that she is simply transferring her own thoughts that she doesn’t want to face. In What the Cat Saw by Carolyn Hart, Nela Farley makes an interesting discovery when she agrees to care for a highly intelligent cat named Jugs. Whenever she looks into the cat's beautiful eyes, she "moves into his mind" and immediately receives messages about a murder he witnessed. At first Nela is disconcerted by this phenomenon and wonders if she is imagining it, but she quickly learns to trust Jugs' feelings about people. A tender romance with journalist Steve Flynn develops in the novel, and the two of them work together to solve a double murder. If Carolyn Hart’s WHAT THE CAT SAW was made into a movie it would be best done as a black and white film directed by a Hitchcock-esq director. 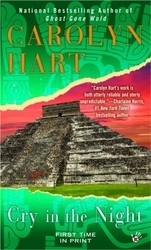 Carolyn Hart is at the top of my list of all time favorite authors. I know when I pick up one of her books I will not be disappointed. 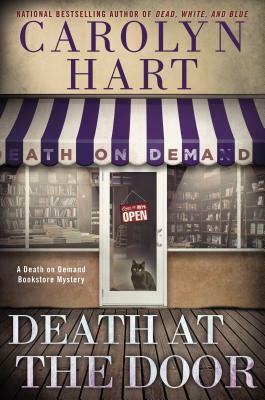 What the Cat Saw is quite different from Hart’s Death on Demand series, but possesses the elements that make her books so readable. 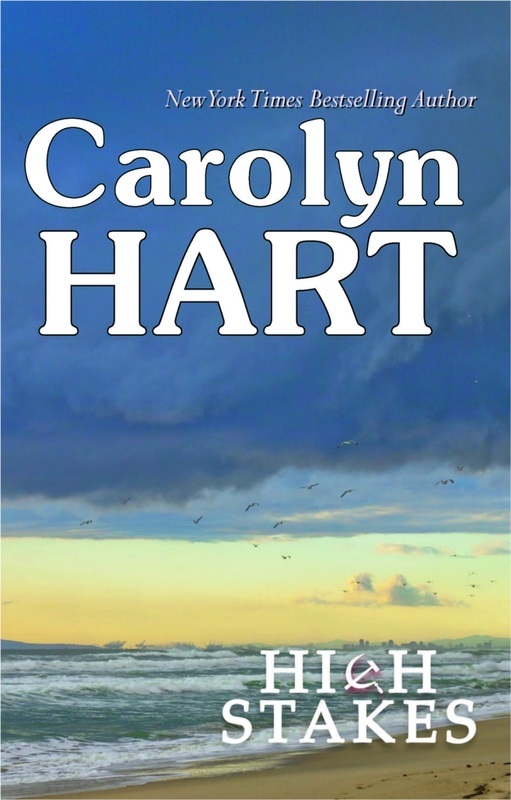 What the Cat Saw is set in Carolyn Hart’s beloved Oklahoma. This affection is reflected with “Sooner” trivia sprinkled throughout the book and is a fun aspect for those readers familiar with the great state of Oklahoma. I couldn’t put this book down until I finished it – I had to find out what happened next. This is totally different from her Death on Demand series. I am hoping that this will be the first of many in this delightful new series. What the Cat Saw was a fast entertaining read. There was a bit of traditional old-fashioned mystery story going on. No goo or gore. No detailed autopsy reports. No cops in high-heels running after the bad guy. Just a comfy - cozy, cup of hot chocolate kind of crime to be solved. 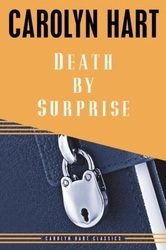 If you want to get addicted to an 'new to you' mystery author- start with this book, then go back and start at the beginning with Death on Demand- you'll be happy you found Carolyn! If you're already a Carolyn addict, then you are gonna love this new book and wonder if a new series could be starting! 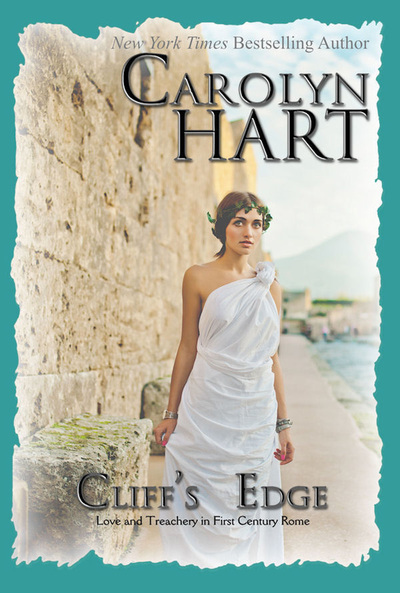 Carolyn Hart’s elegant writing shines in this tightly plotted mystery. There are many characters but Hart is careful to develop each one in memorable fashion. Cat owners will have no problem with the role Jugs plays. As has been said, cats were goddesses in ancient times and they have never let us forget it. If you love cozy mysteries and are looking for a smart new series, I’d recommend What the Cat Saw by Carolyn Hart. The plot revolves around the murder of the founder of a charitable foundation. 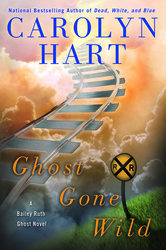 Add a protagonist who can understand a clever cat’s thoughts plus a nice dash of romance, and you have a winner from multiple award-winning author Hart. What the Cat Saw is a cleverly crafted mystery filled with believable characters. The portrayal of Jugs is marvelous—the reader almost forgets he can’t actually talk. Cozy fans won’t want to put this one down until the very end, and they’ll all hope this is just the first in a new, wonderful series! 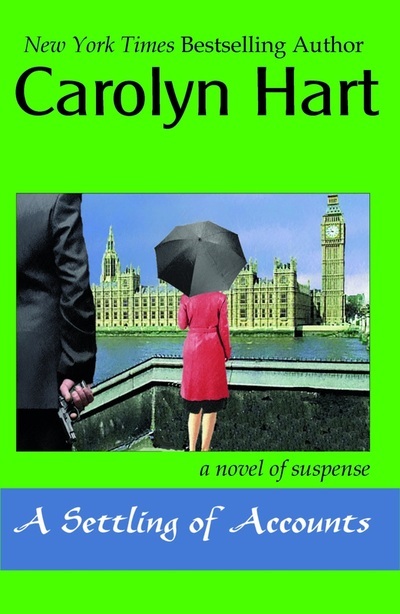 Carolyn Hart has got another winner on her hands with this suspenseful drama that quickly became a page-turner. We are introduced to Nela who has an uncanny ability and when tragedy strikes, information from an unlikely source leads Nela to a killer who’ll do anything to silence her. I loved how the story flowed from one scene to the next, keeping me glued to the pages as I didn’t want to miss what happens next. This was an enjoyable read and I hope we get to see more of Nela. More noticeable in "What the Cat Saw" is the effective combination of Hart's two lead characters. Nela Farley and Steve Flynn are both among the walking wounded, each damaged by past emotional involvements. Their mutual attraction and shared profession, however, suggest that they can become a captivating team of crime solvers, much like the "Death on Demand" duo, Annie Laurance and Max Darling. 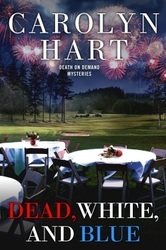 Clever and witty, as usual with Hart, this book is a fine start to a new series. Although she is a reigning queen of the traditional mystery, I like to think of Carolyn Hart as one of America’s foremost practitioners of experimental fiction. 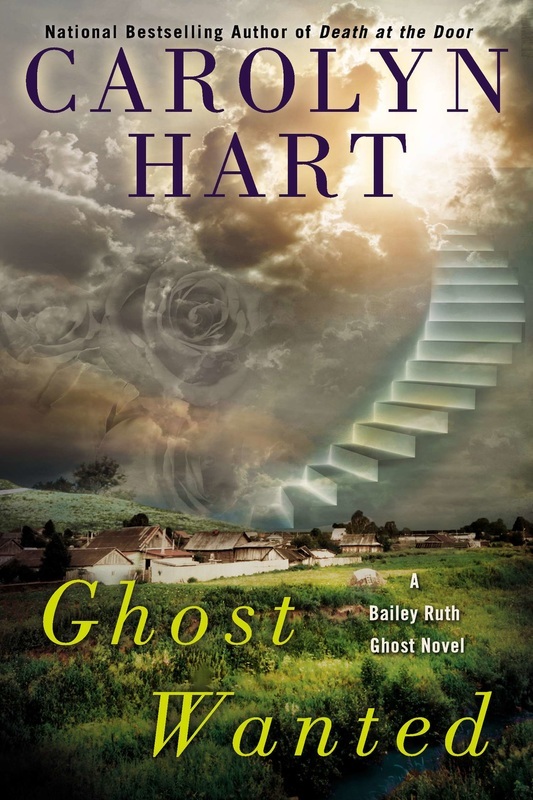 Hart never pushes the cat-communication angle too far in the story, but makes it part of Nela’s amateur sleuthing. Our heroine’s gift will seem entirely plausible to those who have observed the independent but affectionate relationship between cats and their owners (Jugs is sparing in his sharing of thoughts with Nela, which seems exactly right for a cat and his new caretaker). I really enjoyed this novel. It was not easy to figure out who was the murderer in this one and that is a quality that I love in a murder mystery. I wasn't even close to figuring out this one until the very end when everything was explained. The main character Nela is very likeable and has her own issues that she needs to deal with. This makes her a very realistic character and she quickly endears herself to the reader. 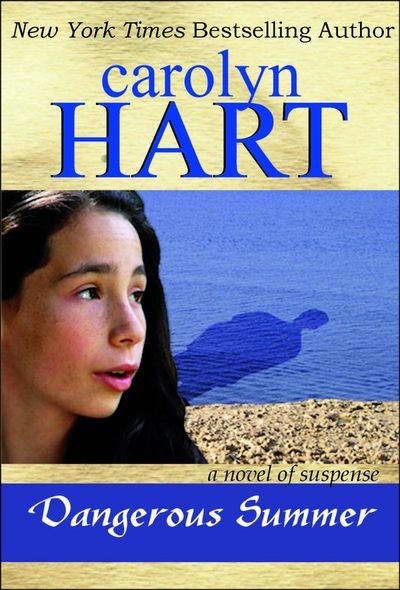 Hart keeps the tension going and the reader wondering right until the end…. For Hart's millions of followers, this comes as no surprise. 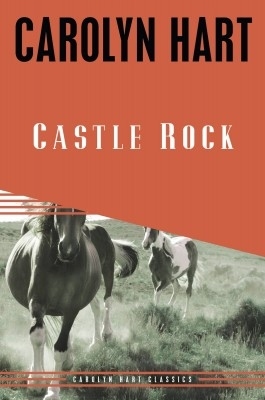 Her skill at character development as well as her ability to put the reader into the tension of the story have been the touchstones for her two series. Nela Farley makes an interesting discovery when she agrees to care for a highly intelligent cat named Jugs. Whenever she looks into the cat's beautiful eyes, she "moves into his mind" and immediately receives messages about a murder he witnessed. At first Nela is disconcerted by this phenomenon and wonders if she is imagining it, but she quickly learns to trust Jugs' feelings about people. A tender romance with journalist Steve Flynn develops in the novel, and the two of them work together to solve a double murder.